Lightweight, durable synthetic leather & updated textile upper. UA ClutchFit ankle support system contours & provides supports where you need it most. TPU toe cap for added protection. Welded PU film surrounds the perimeter of the boot for abrasion resistance. Molded, anti-microbial Ortholite sockliner . Ultralight Micro G EVA midsole for all day comfort. Lightweight TPU shank for mid-foot support & the right amount of rigidity. New, high traction rubber lug outsole for grip in a variety of conditions. Height: 7 . Weight: 13.58 oz. 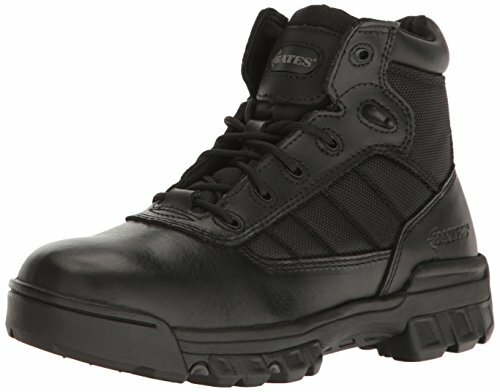 The Bates Ultra-Lites work boot provides superior comfort and reliable protection that's tough enough to handle your everyday duties. Style number: E02700. Full grain leather and 1680 denier nylon upper for excellent durability. Athletic cement construction. Non-metallic construction makes it security friendly. Breathable mesh lining to keep you cool under pressure. YKK nylon side zipper for easy on and off. Cushioned removable textile footbed for all-day comfort. Non-metallic shank for lightweight support and stability. Slip-resistant rubber outsole promotes excellent traction. Outsole passed the SATRA WTM 144 test for slip resistance. Imported. Measurements: Heel Height: 1 in Weight: 1 lb 2 oz Circumference: 12 3 4 in Shaft: 6 1 2 in Product measurements were taken using size 8.5, width B - Medium. Please note that measurements may vary by size. Weight of footwear is based on a single item, not a pair. We ve designed a pair of boots that sets the new standard of excellence for stylish footwear for men everywhere. Whether it s spring, summer, fall, or winter, you need to have a pair of work boots that you can trust. When you choose to work with 5.11, you re choosing to work with a company that actively collaborates with professionals to ensure that we re meeting the needs of our customers. Our ATAC boots are all made with real, full-grain leather and durable, extra-strong nylon. We don t use cheap, faux leather because we know that 100% full-grain leather offers the best quality, so we use it in constructing every one of our rugged boots. These wear-resistant boots can stand up to years of wear and tear, whether you use them on your motorcycle or on a wilderness backpacking trip. If you re looking for a solid pair of hunting boots, hiking boots, yard work boots, or combat boots, our boots are here to help. Their solid, authentic leather construction means they re built to withstand all types of weather while keeping your feet comfortable and protected. Use them for working or exploring. We carry men s sizes 4 through 15 in both regular and wide styles. With so many sizes and color options of black or brown, these are the perfect boots for men everywhere. 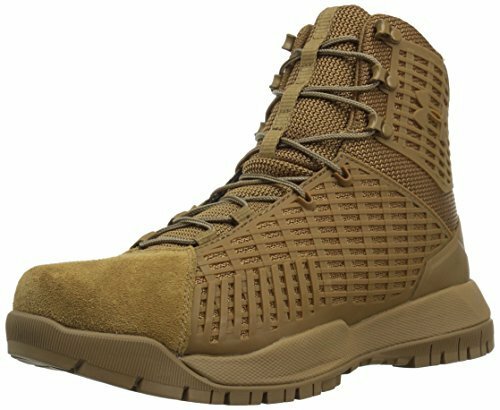 These durable boots are built to American military standards with real materials and no imitations. They re great for both the combat pro and the beginning hunter. Their high cut offers optimal ankle support and makes them perfect for outdoor use. They can protect your feet from the elements and workplace hazards. No matter what you re looking for in a boot, 5.11 has you covered! MULTIPURPOSE WORK BOOTS: Whether you're looking for a solid pair of hunting boots, hiking boots, yard work boots, or combat boots, these boots are here to help. Their solid, authentic leather construction means they're built to withstand all types of weather while keeping your feet comfortable and protected. Use them for working or exploring! TOUGH LEATHER CONSTRUCTION: Our boots don't use cheap, faux leather. We know that 100% full-grain leather offers the best quality, so we use it in constructing every one of our rugged boots. These comfortable boots can stand up to years of wear and tear, whether you use them on the job, on your motorcycle, or on a wilderness backpacking trip. PROFESSIONAL DESIGN: Our boots feature a full-length, dual-density insole with a bottom layer of Ortholite X25 foam for better cushioning and rebound. They also feature a top layer of Ortholite Lazy recovery foam for a custom, comfortable fit. A breathable tongue design allows for maximum airflow. A hidden knife pocket is included so that you can be prepared for anything. MILITARY STANDARDS FOR SAFETY: Our 5.11 boots are built to American military standards with real materials and no imitations. 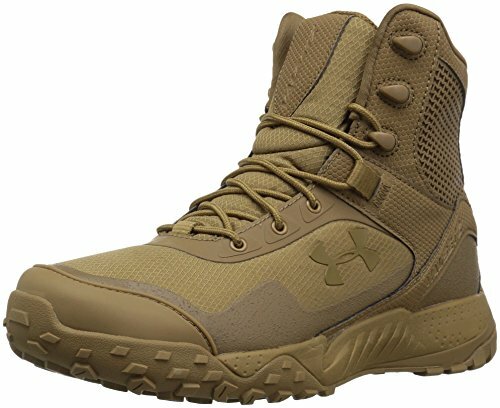 These boots are great for both the combat pro and the beginning hunter. Their high cut offers optimal ankle support and makes them perfect for outdoor use. They will protect your feet from the elements and from workplace hazards. 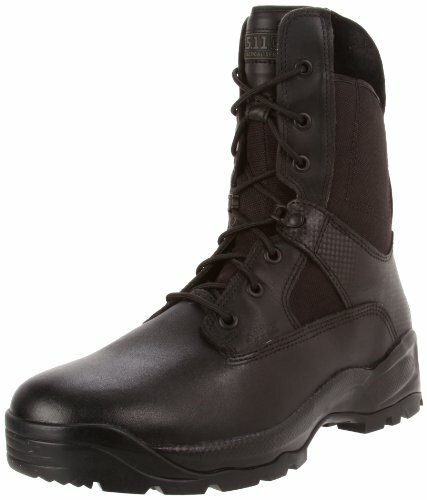 BLACK TACTICAL BOOT: This 8 tactical boot features 100% full-grain leather, 840D nylon, brass hardware, and an Ortholite insole. The full-grain leather toe, 840D nylon upper, and shock mitigation system provide the kind of rugged protection you need, while the knife pocket keeps an important ally within reach. 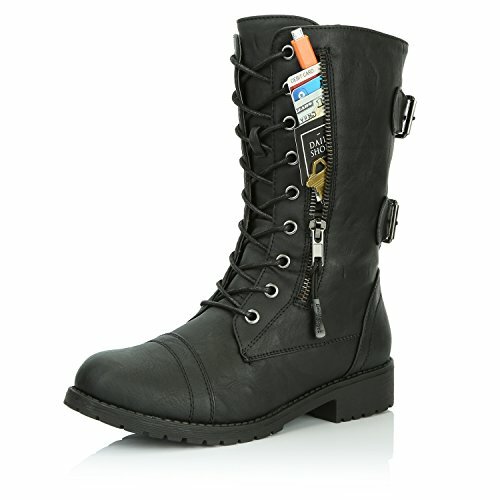 You'll never confuse these sleek, serious-looking Bates 5 Inch Ultra-Lites 2762 Women's Tactical Uniform Boots with your black stiletto heels. These are big girl boots for the serious woman with a serious job to do, and they send the message loud and clear that you're a strong woman.A woman like you needs boots like these. 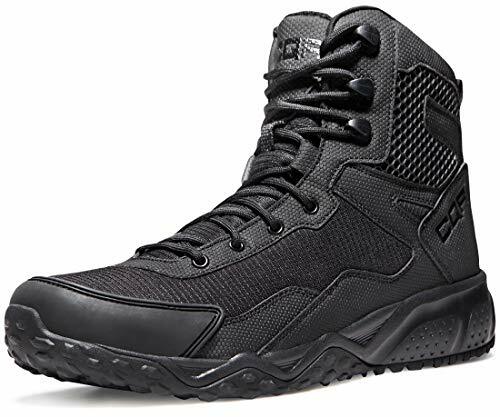 These tactical sport boots were designed to be more lightweight (by 30%) than previous Enforcer Series models, so you can stay light on your feet in intense situations. The sole is constructed with cement and covered with rubber, to give you maximum durability and stability. A woman's strength is greatest in her lower body - so it's important to protect your feet in a pair of boots meant to highlight that strength.The removable footbed allows for easy cleaning and offers support. A thin fiberglass shank gives you added arch support to keep your steps going strong all day long. The soles are oil- and slip-resistant so you'll stay steady, and non-marking so you won't have to avoid inside flooring. 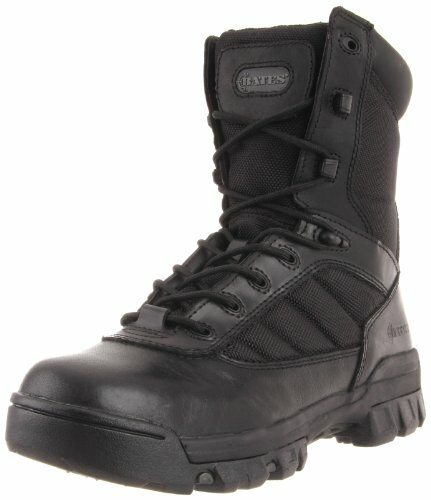 Bates 2762 5 Inch Ultra-Lites Women's Tactical Uniform Boots are for the girls who grew up being tougher than all the boys. Here's to you. Sizes: Medium 5-10This boot is available for men as well under the style number 2262. Engineered to provide superior safety in unforgiving environments, the Women's ATAC 8" Shield Boot delivers unbeatable comfort, protection, and utility in a clean, professional profile. 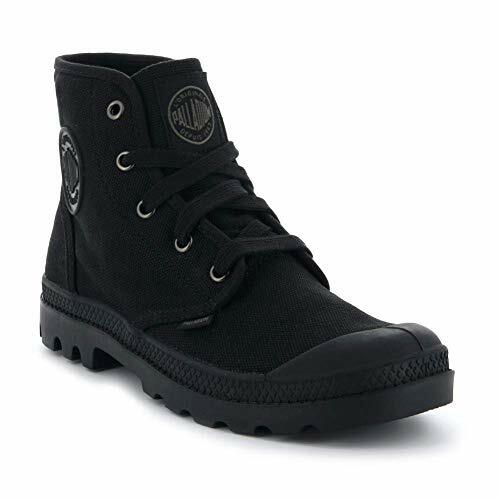 Sized for female operators, the rugged nylon upper provides breathable stability, and the ASTM-certified safety toe and puncture-resistant midsole offer reliable security. Featuring a waterproof, breathable lining and bloodborne pathogen-resistant construction, these boots will keep you cool, dry, and safe. Additional features include our Shock Mitigation System and an oil- and slip-resistant outsole for enhanced speed and traction. Maximum protection in a lightweight, comfortable, long-lasting boot. Simply the best. PREMIUM LEATHER CONSTRUCTION - Made from 100% full grain leather and textile, showcasing a durable construction that's guaranteed to resist wear and tear and withstand heavy use. PROFESSIONAL DESIGN - Featuring the 5.11 Shock Mitigation System cushioned insole and oil and slip resistant outsole with non-metallic shank, delivering better cushioning and rebound. TACTICAL BOOTS - Integrated with semi-rigid heel and toe reinforcement and open cell foam cushion for a custom and comfortable fit, guaranteeing you breathability for maximum airflow. COMFORTABLE TO WEAR - Developed with the traditional round toe and high cut design, these boots boast classic shape while offering optimal ankle support. It will grant your feet the protection it needs against harmful elements and workplace hazards. MODERN FASHION - Engineered to provide superior safety, these boots deliver unbeatable comfort, protection, and tactical utility in a clean and professional profile. Its rugged yet stylish design makes it ideal for both formal and casual look. 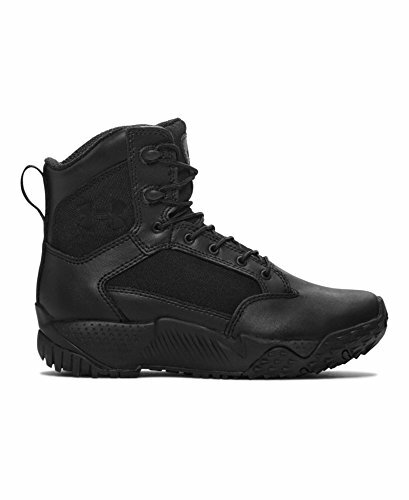 Tread swift and silent with stealth force 8.0 tactical boots. 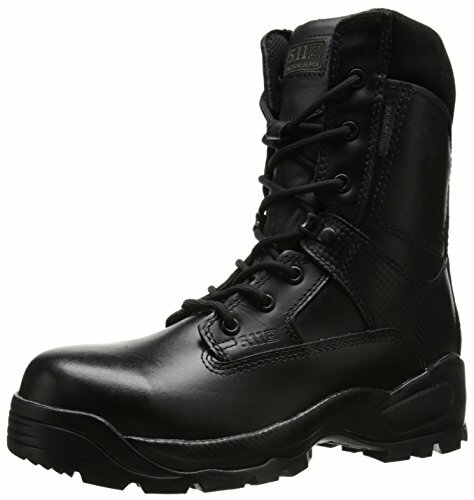 Featuring polishable full-grain and denier nylon uppers, these police boots are designed for the field. Deep lugged outsoles maintain a secure grip on uneven terrain so you can always be sure of your footing. 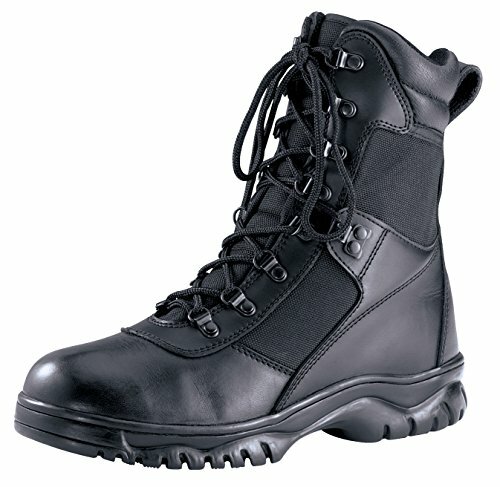 These police boots are also coated with agion antibacterial and water resistant treatments to keep your feet cool and dry on the job. The stealth force series lineup also includes a removable m-p.a.c.t memory foam sockliner and eva midsole for added comfort. 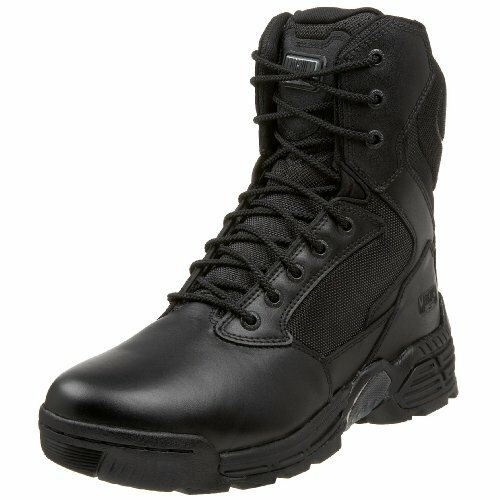 A workhorse of a boot, Magnum's Stealth boasts a combination leather and nylon upper; offering full foot and ankle protection, flexible support, and abrasion resistance. Its moisture-wicking linings will help keep you dry while a gusseted tongue enhances fit and a lightly padded collar and insole add cushioning. Front lacing and a side zipper, along with a safety Velcro strap, makes entry and exit a cinch, and a slip-resistant outsole will help keep you steady on your feet. 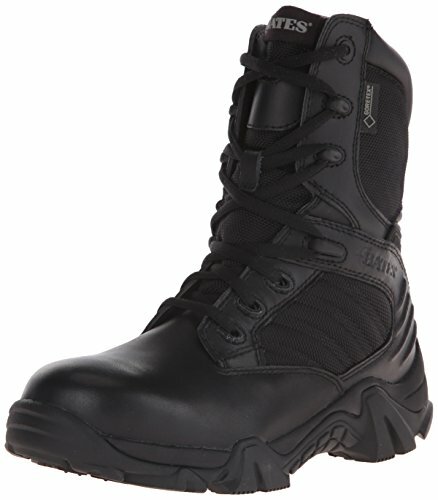 The magnum stealth force 8.0 is the next generation of magnum's top-selling tactical boots. The result is a tougher, more advanced, more comfortable line of boots that include the x-traction zone outsole - a unique combination of ten design technologies that keep your feet stable and agile. 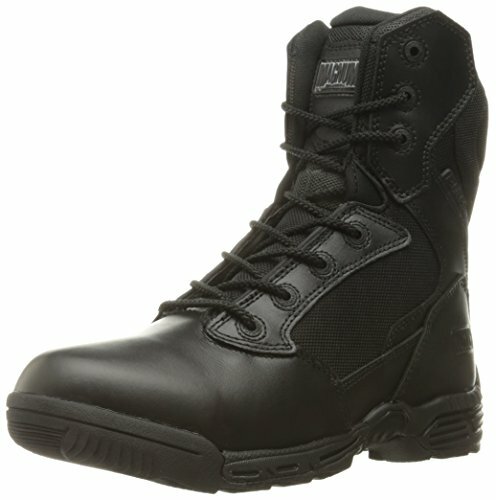 Be effective on the job in this hard-wearing yet lightweight and flexible tactical boot from magnum. Constructed with a durable leather upper, the stealth force is equipped with everything you need for safety and comfort, including nylon mesh inlays for breathability, a heavily padded collar and tongue for support, a compression-molded eva midsole to absorb shock, and a moisture-wicking lining to feet keep feet dry and healthy. The brand's signature x-traction zone outsole is designed for excellent grip on a variety of surfaces. 1. Please refer to size chart before buying. Do not select directly according to you habits. Classic coverage: top swimwear matches with printed bottoms,Retro swimwear will make you regain confidence and fabulously show your curves. Ruched pattern in the torso perfectly accentuates your curves, hiding the imperfection yet still flattering. Pls feel free to contact us if you have any questions about size,quality,etc. Excellent quality: The smooth fabric material is more stretchy, comfortable and soft, ensuring you enjoy it.